Thursday was the last day of my project in Sheffield, and at 6:27 in the evening I boarded a train and headed down to London. Even before I boarded the train, I knew I wouldn’t be eating my supper in Sheffield on Thursday, instead waiting until I got back to London and to my flat. 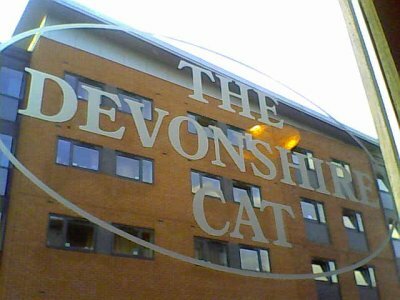 Therefore, on Wednesday evening I knew I would be having my last proper meal in Sheffield, so I headed to my favourite place to eat, the Dev Cat. 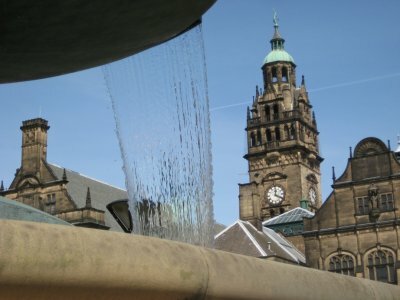 When I first arrived in Sheffield, I found myself faced with a lot of chain restaurants in the centre of town. Now, I am not against chain restaurants per se, but there are only so many times you can dine at Café Rouge, Nando’s, J.D. Wetherspoon’s or Wagamama’s before you are thinking you’d like a change of place. One day, a few weeks after first arriving here in Sheffield, I asked some of the locals I work with for some restaurant suggestions in the centre. “Do you like burgers?” asked one of the women I work with. “Uh-huh,” I replied, saliva building up in my mouth. “Do you like beer?” she asked. “Mmmmmm, beer and burgers,” I replied, drool rolling down my chin and eyes rolling back in my head, cutting a truly Homeresque figure. “Oh, you’ll have to check out the Dev Cat,” she said. The Dev Cat, or more properly The Devonshire Cat is a pub in central Sheffield on Wellington Street. Offering a selection of 12 beers on draught and over 60 beers in bottles, as well as hand-made burgers all at a good price, the place is very popular with students, city-centre workers and locals alike. The first time I saw the Dev Cat, I must admit I was not overly impressed. 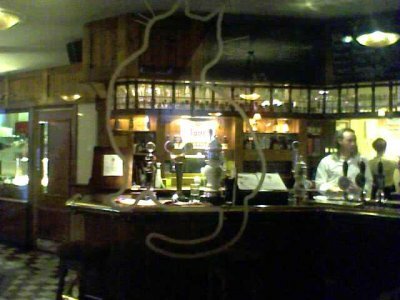 Even though I have been in England for almost a year now and have been in enough pubs that I should know better, when I hear the word pub I still imagine a dark, musty space in rickety, turn of the century house with lead-glass windows, low ceilings and wobbly, uneven floors. 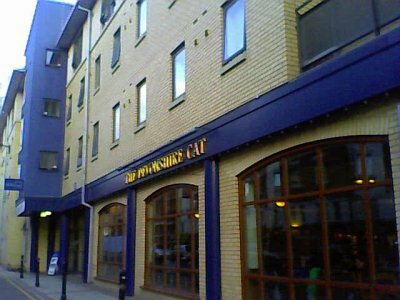 The Dev Cat is on the ground floor of a modern apartment block that is home to students of nearby Sheffield University, and is light and airy inside with floors so even you could bowl on them, if the tables weren’t in the way. Sitting at a table and perusing the beer and food menus, though, put me back at ease, and once I took that first bite into a Dev Cat burger, any qualms about the appearance of the pub disappeared. The burgers were excellent, and the selection of beer impressive. The Dev Cat doesn’t have the biggest beer menu I’ve ever seen, but it has to be the most eclectic. Like many brew pubs, it has selections from different countries, but the Dev Cat seems to go for the weirdest beers they can find. Spontaneously fermenting Lambic beers from Belgium share the menu with pilsners from the Czech Republic. Brews from monasteries are available along side saxon ciders. Kolschs from Germany along side Sierra Nevada from the USA. They also offer Tusker from Kenya, a beer that I drank extensively when I was in Tanzania (which may explain why I never made it to the top of Kilimanjaro). On my last Wednesday, I started with a pint of Bernard Light Tap lager on draught and placed an order for a brie and bacon burger. I was a quarter way through my meal when I finished off my pint. As a tipple for the rest of the meal, I decided to try something a little different. 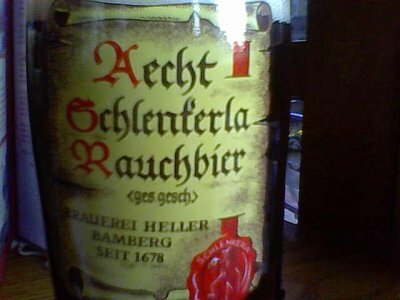 I went for a bottle of the Schlenferla Rauchbier. 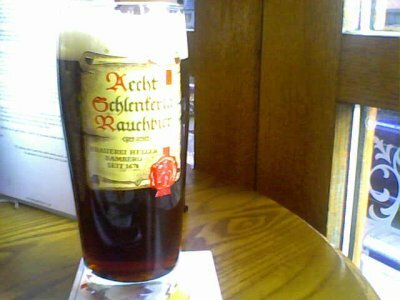 Rauch means smoke and the beer is made by kilning the barley malt over burning beachwood logs, a traditional method from early Franconian history that can be compared with the kilning over peat used to make Islay Whisky (according to the beer menu). Taking a sniff of the dark beer, it smelt like your t-shirt smells after spending a night at a bonfire. The first sip of the beer was strange. It tasted like I imagine drinking a pureed smoked kielbasa would taste like. It wasn’t exactly unpleasant, but neither would I call it enjoyable. Then I had a bite of the burger, followed by a sip of the beer, and it was much better. The meaty taste of the burger, the smoothness of the brie and saltiness of the bacon went very well with the smoke of the beer. By alternating a bite of burger with a sip of the beer, I managed to find a nice mix of complimenting tastes. I will admit in ordering the Rauchbier, I had hoped that it would compliment a grilled burger, and it turned out to work really well. The smoky beer did not work well with chips and mayonnaise. Luckily I had finished off most of the chips while drinking the lager, which was much better with the chips and mayo. 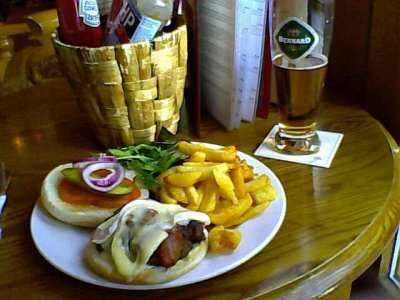 I finished up my burger and beer and headed out into the warm and sunny evening in Sheffield. I would have hung around and tried a few more of the unusual beers on offer, but Arsenal and Man U were about to kick off. Despite having a lot going for it including the best burgers and beers in Sheffield, two things that the Dev Cat doesn’t have is either Sky Sports or TVs on which to show Sky Sports. The Dev Cat just isn’t the kind of place you can be at when an important sporting match is on. See, that’s the kind of honest appraisal you won’t get from those endorsed travel writers. Perhaps I am not a sucker after all. No, I’m probably still a sucker. Sucker or not, either way I’ll miss the Dev Cat’s burgers. Looks delicious! I guess it must be time for lunch! Dev Cat is my favourite pub! Hope you enjoyed Sheffield!